Traffic Issues, - Speeding and Parking including on pavements and verges. The Meads Neighbourhood Panel has been operational for over 9 years. It continues to deal with a range of issues affecting part of the Meads Ward neighbourhoods; some of the issues are the same as elsewhere in Eastbourne. We continue to progress issues raised in previous meetings and by residents between them, to a satisfying success rate. So, if you are aware of any neighbourhood and/or community issue(s) in the Meads Ward that you or other residents would be pleased to know were being dealt with, I encourage you to participate. Please contact your Neighbourhood Watch scheme Coordinator or me via this site.The Panel cannot deal with what we do not know! At this meeting, I will be stepping down as Chairman and the election of a new Chairman will take place. The Meads Neighbourhood Panel has been operational now for five years. It continues to deal with a range of issues affecting our Meads neighbourhood. Some of these issues, criminal and civil, are the same as elsewhere in Eastbourne. We heard from the Police at the October meeting that crime over the last 12 months was still at an all-time low for our part of the Meads Ward. The coverage of the area by Neighbourhood Watch schemes now in place and the close cooperation with the local Neighbourhood Policing Team members is paying dividends. Other matters are to be found in the Minutes of meetings on this site. So, if you are aware of any neighbourhood and/or community issue(s) in the Meads Ward that you or other residents would be pleased to know were being dealt with, I encourage you to participate. Please contact your Neighbourhood Watch scheme Coordinator or me through this website. The Panel cannot deal with what we do not know! In its work a List of Important Contact Details has been produced as a useful aid for residents to report incidents and other matters to the appropriate partners in the first instance. The Panel has been told on many occasions that personal contact reports count and will be valued and used to determine appropriate action. The new EBC operational structure of Customer First reporting is designed to ensure that reports are considered and appropriate action determined and undertaken. Please use it. Eighty years ago, the land was conveyed to the then local council after the death of wealthy Helen Reid Stewart Hornby Lewis, after whom the garden is named. The land was then landscaped before formally being opened to the public in 1935. Following EBC Applications covering Helen Garden and other like Eastbourne open spaces to the recent national Queen Elizabeth Field Status Award, the Council gained the coveted status for Helen Garden. It means that this lovely garden and recreational space is now protected forever from any future plans for development. A plaque to commemorate the Award was unveiled recently and fixed to the Pavilion wall. 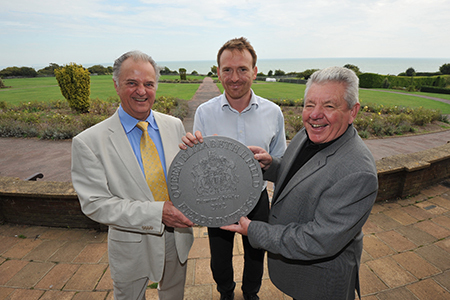 In the picture with the plaque are left to right; Roy Peacock Chair of the Meads Neighbourhood Panel, David Henry EBC Advisor of Open Spaces and Dennis Scard Chair of Meads Community Association and a member of the St Johns Bowls Club within the garden. The Meads Neighbourhood Panel last met on 5th December 2012. Draft meeting notes can be found on the "Meeting Notes" page, with notes from the previous 25 meetings. If you are aware of any neighbourhood and/or community issue(s) in the Meads Ward that you or other residents would be pleased to know were being dealt with, I encourage you to participate, contact your Neighbourhood Watch scheme Coordinator or me. The Panel cannot deal with what we do not know! The next Meads Neighbourhood Panel meeting will be held on Wednesday, 6th February 2013, at 19:00 to 21:00, in Room G41, Brighton University Hillbrow Site, Denton Road. I look forward to seeing you there intent on pursuing issues you are aware of in your Neighbourhood or elsewhere in the Meads Ward. The Meads Neighbourhood Panel has been operational now for four years. It continues to deal with a range of issues affecting our Meads neighbourhood. Some of these issues, criminal and civil, are the same as elsewhere in Eastbourne. We heard from the Police at the August meeting that crime was at an all-time low in our part of the Meads Ward. Could this be due to the increasing number of Neighbourhood Watch schemes now in place? In its work a List of Telephone numbers has been produced as a useful aid for reporting incidents and other matters to the appropriate partners in the first instance. The Panel has been told several times that personal contact reports count and will be valued and used to determine appropriate action. The next meeting of the Meads Neighbourhood Panel will be on 5th December 2012 at 7:00pm in Room G41, Hillbrow, University of Brighton. Residents are asked to be on the look out for anything suspicious after a spate of thefts of lead from church and garage roofs. Should anything suspicious be seen please contact the Police on 08456070999 or 999 in an emergency. The University: It was agreed to keep the University as a priority as there appears to be ongoing issues with the anti social behaviour from the university students. Kevin Mannall from the University deals with any anti social behaviour within the university and he can be contacted on 01273 643102 or by e mail k.mannall@brighton.ac.uk - or during office hours from Monday to Friday. Any emergencies please telephone 999. Op Blitz, PCSO Dave Smith and NRT officers have shown more high visibility presence to check the area frequently. A student meetings was conducted at the Welkin Halls and police are working closely with the student union and the university. Posters have been put up throughout the university regarding anti social behaviour and respect for neighbours. Plain clothed polices officers will be conducting patrols in Naomi Close. Work is in progress to deploy several speed checks within the area. The council are the enforcers behind the no cycling on the promenade. We have liaised with them, and the Council Enforcement Officers have spent time along the promenade stopping cyclists. The Meads Neighbourhood Panel had its first meeting this year on 10th February. 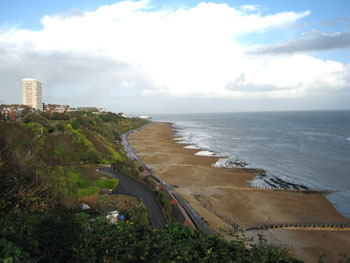 There are fewer neighbourhood issues to deal with when compared with elsewhere in Eastbourne and they are being pursued. To find out more about the Meads Neighbourhood Panel, please use the buttons above to visit the other pages of the Meads section of this website. For more information about Neighbourhood Panels in general, go back to the 'NPHome' page. We continue to have success in dealing with issues raised in previous meetings and during the program of Police Street meetings. So, if you are aware of any neighbourhood and/or community issue(s) in the Meads Ward that you or other residents would be pleased to know were being dealt with, I encourage you to participate, contact your Neighbourhood Watch scheme Coordinator or me. The Panel cannot deal with what we do not know! Since the inaugural meeting in December 2008 this Neighbourhood Panel has met on seven different occasions. The minutes of these meetings are accessible from this web-site. The Meads Neighbourhood Panel (NP) is a forum at which the views and concerns of residents of our neighbourhood can be fully aired. The Panel is working alongside the community and partner agencies to address local issues. These issues are being fed back to Eastbourne Police, The Borough Council, East Sussex County Council and the Brighton University via representatives who attend our meetings. The experience of the Meads NP so far is that it has been able to deal successfully with some of the issues causing local residents concern and it is proving to be effective. Of all the issues in the neighbourhood the behaviour of students, whether of Brighton University or international language schools resident in the Welkin building in Gaudick Road, is the major consideration. The previous Local Action Team and now the Panel, continue to be involved in tackling matters relating to the three priority issues identified at the outset meeting. The participating residents, Meads Ward Councillors, council staff, University representatives, student representatives and the local community policing team enjoin to deal with anti-social behaviour such as Noise, Parking and Litter. Feedback covering the Brighton University students from last autumn and the international students during summer 2009, suggests that the measures taken so far are having a positive impact. Re-enforcement of these measures and the need to address how to alleviate a repeat of anti-social behaviour during this current University academic year and during the anticipated influx of 300 plus International language school students in the Welkin Hall facility next year, 2010 continue to exercise the Panel. As yet it has not been considered necessary to resurrect the University LAT. Traffic – Parking and Speeding –Here again there has been some success stories particularly on parking. In a few cases residents have been able to agree on a solution to their problem and put it successfully to the authorities to realise a change to the pertaining conditions. This is local knowledge working to good effect brought about by the presence of the Neighbourhood Panel. Speeding, an anti-social problem all across the town has been observed and measured on roads in Meads ward and will shortly be more rigorously policed here. So watch out! Overgrowth of shrubs, hedges and trees: - Here the response by residents to being asked to clear overgrowth has been positive. However, in many cases the request has been met by a response of ‘I didn’t know it was a problem’ when very obviously the overgrowth was obstructing the pavement or the view of drivers at road junctions, or, in the case of trees, restricting street lighting this particularly when in leaf and/or totally encompassing the lamp. While the success on this issue has relegated it to one of lower significance, it will nevertheless continue to be pursued as and when necessary. Cycling on pavements: - Again, this is an issue common across the town. As such it is likely to require a higher level of intervention. Resources are required that have the ability to identify suitable approaches to resolve it. Eastbourne has a dearth lack of cycle lanes throughout the town and cyclists most likely see the pavements as safe havens away from road traffic. ESCC Highways along with other authorities are reviewing and consulting in order to develop cycle lane solutions. Meanwhile, any cases of anti-social behaviour by cyclists on being asked to move off a pavement in Meads will not be tolerated and each offending cyclist pursued by the authorities. As for other issues raised and pursued during the past year or so, please see the minutes of meetings on this web-site for details. The issues have included, rights of way, dog fouling, obstruction in Meads Street, camper vans, vehicles advertised for sale, Google street view, riding of horse on pavements, All Saints and Helen Gardens, Meads Club and state of pavements and footpaths. Members of the Meads community got together for the first Meads Ward Panel meeting on Wednesday, 10th December 2008, at 19:30 in Brighton University, Hillbrow Building, Denton Road,Room G41. We are grateful to the University who have offered this venue when free for other LAT or NP meetings. Our local Neighbourhood Policing Sergeant, Julian Williams chaired this first meeting. Discussion was much about the role of Neighbourhood Panels, identifying from those present the top three priorities within the Ward (or within areas of the Ward),identifying who might be needed to attend future meetings, and to seek/appoint volunteers to chair and take minutes of future meetings. Traffic issues - speeding across the Meads Ward and an increased number of vehicles parking in lower/middle Meads, displaced by the new parking zone, obstructing access to residents' premises. Roy Peacock, Meads Ward Neighbourhood Watch Coordinator volunteered to chair the first few meetings, and Lionel Lacey-Johnson volunteered to do the notes. In due course you will be able to view the members on the NP by following the link on this website. As stated above, hopefully our future meetings will take place in the Brighton University, Hillbrow Building, Denton Road. It is very early days having only just had the first meeting, but the panel is there to represent you, your views, and your desires for the neighbourhood and to address your concerns. If you have points that you would like raised please complete the feedback or survey forms on this website and when you press ‘send’ they will automatically be delivered to your Chairman. If we don’t know what you, the residents and traders in this town, want we can’t take steps to achieve it. Better still, if you would like to contribute or participate in the Meads Ward Neighbourhood Panel(s), please contact our local Police Community Support Officer (PCSO) or Police Constable.